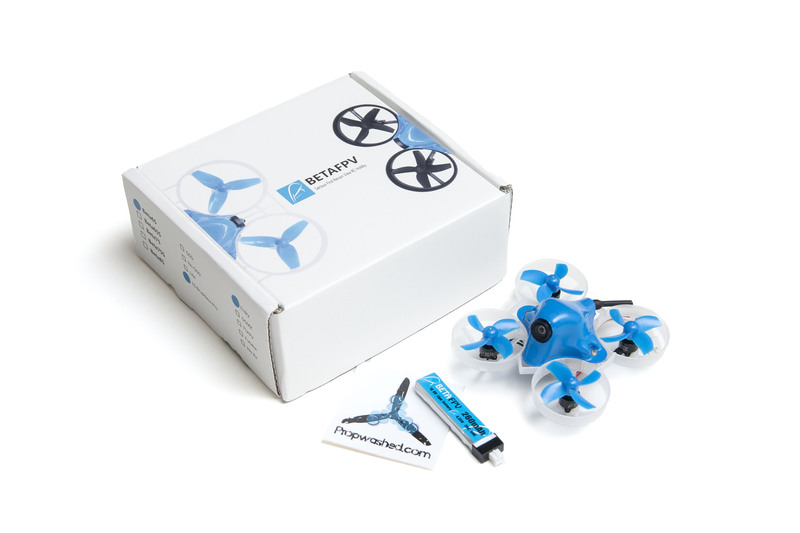 The Beta65 Pro is a 1s Brushless micro quadcopter from BetaFPV. A few months ago, we took a look at a different whoop-sized brushless micro, which fell quite a bit short of our expectations. Today, we’re giving another company a shot at the same formula—and they’ve presented us a product with considerably more success. BetaFPV provided this sample for review. Quad? Check. Battery? Check. Ship it. No time for stickers. Included in the box is the quad and a battery. You don’t get the usual niceties like spare props and a battery charger, nor do you get the usual array of frippery like a prop puller, screwdriver, or stickers. A manual? Not here. Receiver options are FrSky, DSMX, S-FHSS, or none. We’re looking at the FrSky version, which can operate in either D8 or D16 mode. BetaFPV’s frame is pretty rigid, but I did have a break in one of the center struts of my battery compartment. The base on which BetaFPV’s micro is built is a frame of their own design. It’s obviously inspired by NewBeeDrone’s Cockroach with the sizing and position of various items, but there’s enough difference when you look at the details to know that BetaFPV is putting thought into their own creation and not simply trying to profit off someone else’s work. The frame appears pretty durable and is double-reinforced in many places, yet the weight stays under 4g. There are a few weak points, though; I have a snapped strut at the top of my battery holder area. It shouldn’t affect the frame rigidity much but might cause the battery to wobble around a bit more. Try to avoid breaking it when pressing the bind or boot buttons. My Beta65 Pro came with the second version of the frame, but if you order the frame directly you’ll get the third revision with added tabs that deflect crashes away from the propellers. It’s encouraging to see this kind of ongoing development. This 3rd version also has a redesigned battery holder, but I’m not sure it would make a difference where the strut on mine let go. Curved, tightly packed magnets in this 0603 19000Kv motor really bring the power. Tiny 0603 motors provide thrust through four-bladed 31mm props. Each motor is claimed to produce 19000Kv and has an open-bottom design. This is another area where you can tell BetaFPV is trying to innovate. Their first motors had issues with the motor bells coming off. A second iteration laser-welded the motor bottom so separating them was impossible. 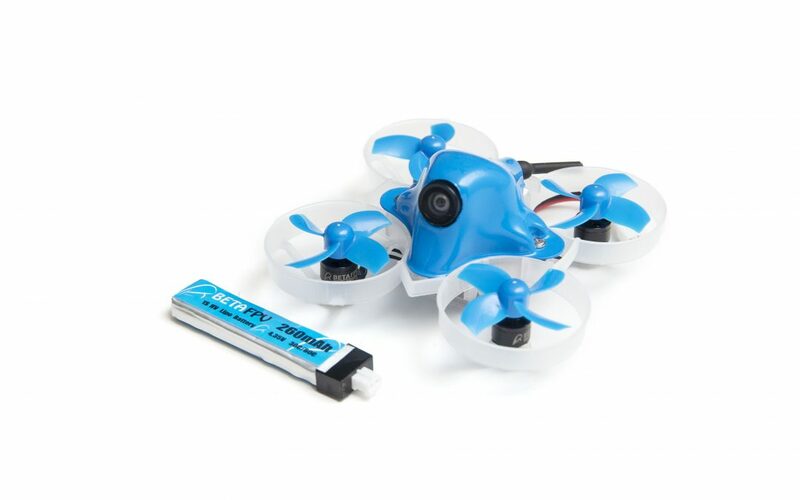 The third version, included with the Beta65 Pro, has tiny E-clips similar to many larger brushless motors. Also among the updates to this most recent motor is a change to curved magnets, reducing the distance between magnet and coil down to where it would be difficult to slide paper in between. The motors are wired into connectors, so you get two wired for CW and two for CCW. A receiver antenna is well protected under the canopy by wrapping it around the lens. The props aren’t a direct copy of the Inductrix, either; the pitch appears similar, but the blades have a more pronounced curve and a wider tip, giving more surface area at the outside edge, and they also have a slightly extended tip underneath. 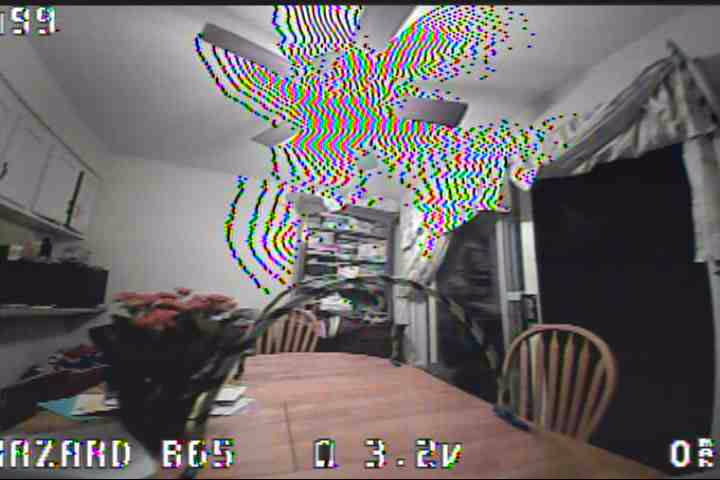 Breaking props on a whoop almost never happens, but BetaFPV doesn’t provide spares. Don’t rely on your existing whoop collection for drop-in spares, either. These motors have a 1.0mm shaft, which is 0.2mm wider than most. ESCs are 5A (each) and BLHeli_S, meaning they support DShot, its auto-calibration, and advanced features like crash-flip (anti-turtle) mode. This also means the craft supports ESC beacon. If you dare to take this capable whoop outside where it will easily get lost in short grass, this is a nice feature to be able to set up. It’s not even close to matching the volume of a dedicated buzzer, but there’s no extra weight involved. The VTx can only be changed by this button, after removing the top cover. BetaFPV’s camera performance is very good among micro cameras, and beats out low-end cameras intended for 5″ quads. There is good contrast, acceptable color, and light-to-dark transitions are handled quickly. The camera also has a wider dynamic range than I’m used to with micros, keeping more details visible in each frame. There seems to be a slight bias toward keeping detail in the highlights and losing a small amount of shadow detail as a result, but that keeps indoor room lighting from blowing out large portions of the frame. Even though the view angle is similar to most whoop cameras, (120°,) the camera is mounted where props and ducts are (nearly) out of view—a somewhat unusual characteristic for these tiny frames. The lens introduces some pincushion distortion, which isn’t uncommon for micro cameras and is barely noticeable when flying. The camera is mated to the video transmitter by a pin header, reinforced with direct soldering at a fixed 20° uptilt angle. This looks like a flimsy connection, but it’s supposedly engineered to take crashes well. At least while protected by the canopy, I didn’t have any issues—even after handing the craft over to a 10-year-old. This VTx has a hard-mounted linear (dipole) antenna, which sticks out the back and seems pretty durable and protected. Circular polarization would certainly help in indoor environments, but weight and durability rule out most CP designs. Range is consistent with expectations at its fixed 25mW output power. Here’s what the video striping looks like, when it appears—but it’s not quite as distracting in flight as this frame capture would have you believe. On a few occasions, I saw heavy striping in the highlights. This is a very distracting visual effect where bright areas on the picture get strong black lines running through them. The striping followed from one battery to the next across restarts, and would occasionally flicker on and off as I flew. It wasn’t a frequent occurrance, and waiting a while between flights was often enough to make it go away again. Since everything else is current-gen tech, I was a little surprised to have to change the video channel manually. The only way to do it is with the single button on the VTx board. It’s as you would expect; short press for channel and long press for band. There are two rows of LEDs that indicate which is selected, but you have to consult the website to find out which setting belongs to what frequency. Print this out and keep it with you if you ever plan to fly with others. Adding to the surprise, the VTx is entirely covered by the canopy. You have to remove two small screws to get the canopy off before you can press the button to make changes. This is a poor design for racers, who need simple access to make channel changes often. With all the great features integrated here, not having remote frequency selection feels like an omission. BetaFPV has already developed an upgraded camera module with Smart Audio, so perhaps it’s only a matter of time before the 65 Pro gets this upgrade. When the Beta65 Pro arrived, I pulled it out of the box in one piece. Even the battery was tucked into the holder on the quad as if everything were ready to go. The process to get it set and flying proved nowhere near as simple as this presentation belied. First up, binding. This isn’t hard. Bind mode can be activated at any point with a long press (the FC’s page says 3s, but it only took about 1s for me) on the bind button. The button is easy to press but reasonably protected inside the frame from accidental hit in a crash. After that, go to bind mode on the radio. I had no problems with this at all. The next step is setting up your receiver channels in Betaflight, which is a pretty standard part of the process. If you need a refresher on this, check out our Betaflight configuration guide. After binding, I ran into my first problem. The radio would simply not maintain its connection. I was getting dropouts (RX LOSS) so frequently that I couldn’t even take off after arming. The FC supports both FrSky’s D8 and D16 mode, and came configured for D8. I switched to D16—which required a rebind—and the connection was much better. 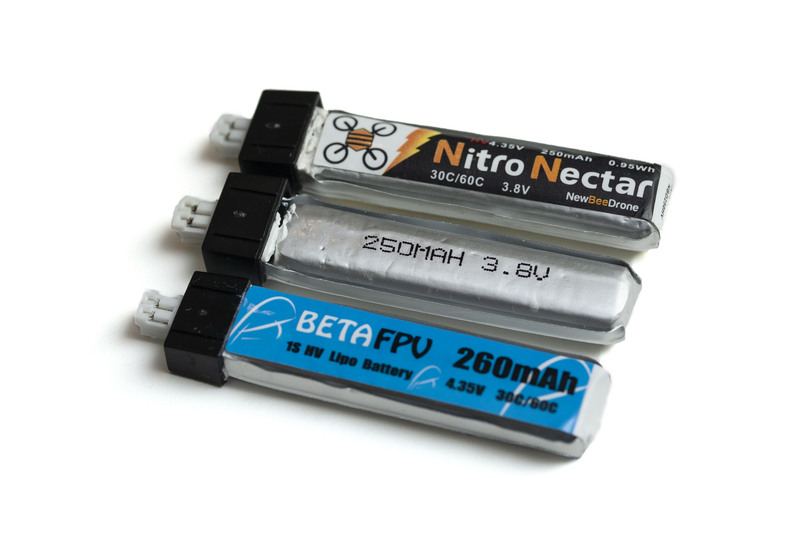 The Beta65 Pro uses BetaFPV’s F4 controller with built-in receiver and ESCs. It’s quite capable, but plan to spend some time configuring it. After switching, and then rebinding, I ran into another problem right away. 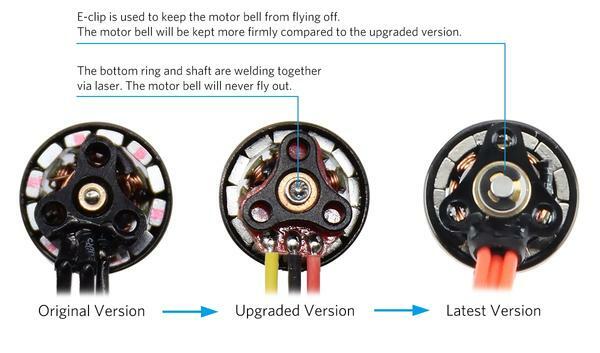 Two of the motors had reversed directions set up by default in BLHeli. I didn’t expect this and it took a little while for me to figure out what was going on. It’s not hard to fix, but you do need a configurator for BLHeli_S. BetaFPV describes the process on a troubleshooting page, too. The reason it’s set up like this is likely because of the motor upgrade; older motors only came wired in one direction but the newer motors have CW and CCW varieties. Finally I got in the air. The PIDs were okay but there was some oscillation. I quickly found that flights would last for only short periods of time, and then the flight controller would lock up and the quad just drop out of the air. I got one or two full-battery flights, but the lockup happened with unacceptable frequency. I researched the problem and found that BetaFPV suggests to flash 3.4.1 and disable telemetry. Elsewhere, I learned that there’s a bug with Betaflight 3.4.0 (and older), flight controllers with built-in receivers, FrSky D16 mode, and SmartPort telemetry that causes FC lockups. Flashing was not straightforward either. I’m quite familiar with all the ways one can coax a board into boot mode, but this board would have none of it. For half an hour I tried every trick I knew but the board would not read over USB once in boot mode. Frustrated, I put the project down and did something else for a while. When I came back to it several hours later, it just worked, first try, no fuss. It’s possible this was a PC problem instead of an issue on the FC. Flashing a FC with built-in receiver means it loses its bind, so I started the whole process again from step one. At this point, I noticed Betaflight had an extremely poor response time to the incoming gyro (and other sensor) data, lagging by a few seconds. It would also sometimes stop responding to incoming data. 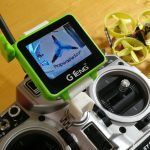 I had come across BetaFPV’s FC page with recommended settings. After I dumped these into the CLI, Betaflight started acting normal again and I could set up everything else. Once I was finally through that rigamarole, I was able to get some good flights in. New owners should just reflash as soon as they open the box. You’ll also need to check the motor direction in BLHeli, and load up BetaFPV’s recommended settings. The good news is, since the updates, I haven’t experienced the FC lockup at all and the PIDs also seem much better than those first few flights on 3.4.0. The flight experience is now quite good. If you’ve only flown brushed micro quads before, you’re in for something special. Compared to your typical brushed “Tiny Whoop,” even those with upgraded motors, the Beta65 Pro has a truly impressive increase in power. On a 65mm micro platform, this is a game-changer—and I don’t use that term lightly. 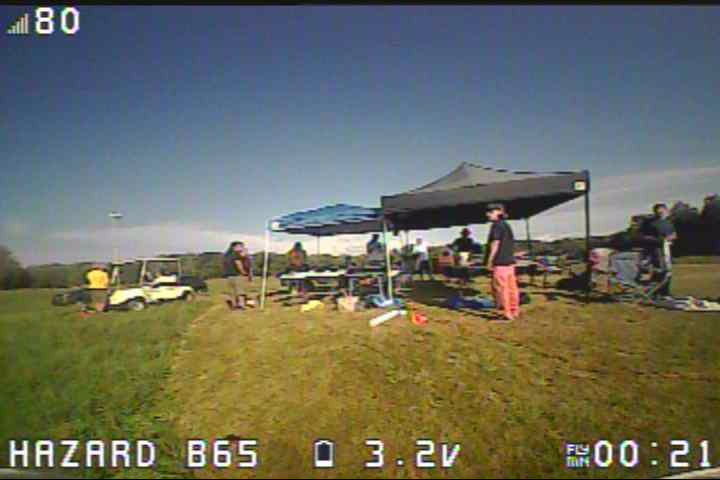 Taking the 65 Pro up outdoors after a race event. This little micro had great speed and agility, even outdoors in the wind. 3.2V at only 21s into the flight is not atypical. The first thing you notice is that you get a much more responsive feel to your throttle movements. Bouncing up and down through different height obstacles becomes much easier, and the frame instantly moves at your command. By comparison, A typical brushed micro takes absolutely forever to change course. This added power and responsiveness means you have to tame your inputs substantially. A much smaller range of the stick is acceptable, making the Pro require far more skill to fly. A note to racers: get some practice in with the Pro before taking it out to your first event; the difference in throttle response requires re-learning the muscle memory that’s so critical to staying on a good line. The power increase dramatically improves handling with respect to propwash. Descending through your own propwash in a brushed whoop is a recipe for spiraling out of control, but the 65 Pro handles it as if that air is barely disturbed. If you’re only flying on your own this may not be a major concern, but for racing the implications are huge. Dives within a micro course become possible, and passing under or being passed over by other racers doesn’t result in an immediate grounding. Better crash recovery on the Beta65 Pro isn’t just about propwash. I found the brushless platform to better withstand the typical knocks into objects that would send a brushed whoop skittering across the floor. The additional power is often enough to prevent the death spiral from taking hold, so just bouncing off furniture is no longer fatal. It’s still inevitable that you’ll end up upside-down on occasion. At those times, you can kick in anti-turtle mode, and the 65 Pro actually has enough power to flip itself back over so you can keep on going. You don’t have to be a racer to appreciate that. All of this power comes at a significant cost to flight time. A typical 250mAh battery lasts between two and two and a half minutes, or roughly 70% of what you might get on a brushed platform. You’ll experience more voltage sag than you’re used to during the flight since the amp draw is pretty high on a battery this size. Expect to see your voltage drop to 3.2 very quickly after you take off. You should be thinking about landing at 3.0V, but flying is still possible down to 2.8V. When pulling your battery off after a flight, you’ll notice that it’s fairly warm—not dissimilar to a full-size battery after a 5″ race. This could be a sign that you can expect shorter lifespans from the batteries you use on the Beta65 Pro. But you won’t care. The Beta65 Pro is even quite a capable machine outdoors. I flew mine in moderate wind—probably about 10mph—without much trouble at all. It retains all the advantages of the small size in gap hitting, being able to fly anywhere, and being completely unintimidating. I’m looking forward to exploring trees and whatever other interesting things I come across. Check out some footage from an outdoor flight in ~10mph wind, or indoor on a “tiny whoop” race course during a practice session. The battery is a standard Inductrix form factor, with the common JST-PH (2.0mm, “powerwhoop”) connector. The only modification from stock that I recommend is cutting a hole in your canopy. This would allow you to reach in with a toothpick (or non-conductive screwdriver) and press the VTx channel change button. You could also take the canopy off entirely, but it’s pretty lightweight and doing so exposes the camera/VTx to more direct hits in a crash. If you require repairs, every part is available individually from BetaFPV. The Beta65 Pro mostly uses the top upgraded components available already, but a few alternates and improvements can be found. For example, an upgraded camera/VTx combo with SmartAudio would be another way to address the channel selection challenge of the stock model. 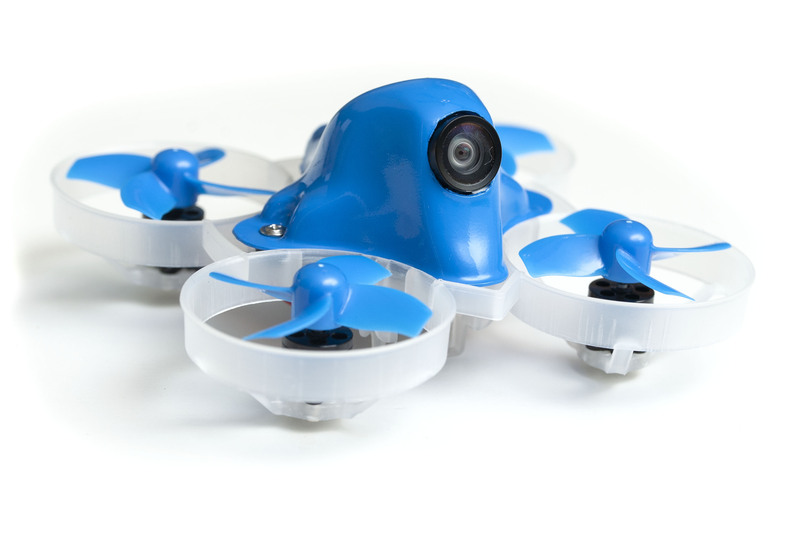 BetaFPV makes a nice-looking whoop, but you’d better like it in blue. At first, BetaFPV’s Beta65 Pro had me worried. The setup process was long and complicated, and I encountered several bugs and snags along the way that seemed like they might be terminal, going the same route as the Snapper6. I’m glad I persisted. Once those hurdles were clear, I’ve really enjoyed flying the Beta65 Pro. The added power makes it very agile and fun to fly, but offers quite a few advantages to me as a frequent racer in its resistance to propwash and crashing in general. When a crash does happen, I can use anti-turtle to pop back up, or ESC beacon to help locate the craft. The price is reasonably competitive for a high-end micro, at about $115. There’s still a little room for some improvement, like having to remove the canopy to change video channels and a fairly extensive setup process that first-time pilots would find daunting. BetaFPV may address some of these in later releases, since their products appear to be under constant development. The higher stress on flight batteries might factor into your decision as well, but instead of looking at $25 for a battery, you get an 8-pack for that price. For as much as I enjoyed flying it, the Beta65 Pro may not be for everyone. Specifically, we wouldn’t recommend it as anyone’s first drone. There’s not enough in the box to really get you started, (no charger, no spare parts, no setup manual,) the initial setup took a lot of prior knowledge to complete, and the impressive power output is really too much for a starting pilot. 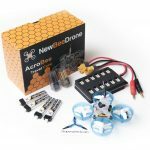 Sticking to a brushed micro like the AcroBee might still be the way to go if you’re just getting into the hobby. If you’ve already got a brushed whoop and are looking for something more exciting, or if you’re a seasoned racer who hasn’t yet ventured into micro classes, I would definitely recommend the BetaFPV Beta65 Pro. It’s an enthusiast’s micro to the very core, and one I expect will provide many hours of exciting flight.